RUTLAND—On President’s Day, Monday, Feb. 20, dozens came out for the Frosty Feet 5K Run/Walk for Autism Awareness, which began at 11 a.m. at the Rutland Country Club. The event was part of Rutland’s 15th annual Winter Fest celebration, Feb. 17-25. Despite the frozen conditions, runners and walkers were all smiles as they carefully made their way around the snowy course. A wide variety of activities continues through Saturday, Feb. 25. For a complete schedule of events, visit winterfestvt.com. 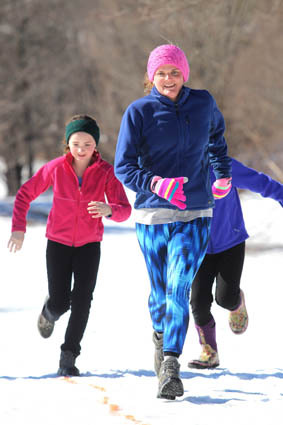 Brooke Haley Kimbal and two young runners crest a snowy hill.